Public land. Late season. Mute gobblers. We all run into it. Here’s how to pull out the stops and tag a longbeard that won’t cooperate. Spring turkeys, whether due to intense hunting pressure or a waning season, can prove frustrating characters. Consistent turkey-hunting success often hinges on having a place to hunt that receives less hunting pressure, or simply being lucky enough to arrive on that one weekend a season when gobblers are sounding from every ridge or hollow, willing to run into the most basic calls. For those without prime hunting ground or unlucky enough to miss the breeding peak, sometimes unorthodox ploys are what bring a season to a successful close. Many seasoned turkey gurus actually enjoy the toughest birds, leading to tales of birds that have eluded nimrods season after season. Most hunters, though, simply want to enjoy some action, at least receive a shot, even if a classic call-up doesn’t lead to that filled tag. When the most reluctant gobblers are involved, sometimes out-of-the-box thinking is required. Some of the most difficult turkeys of the season are encountered early and late in the spring. Early gobblers often “hen up,” meaning a good number of hens gather with one lucky gobbler. These birds have no reason to come to your calls, having all they can handle immediately on hand. Later, say by mid-May in most regions, toms have mostly ceased gobbling, hens are off somewhere sitting on nests and suddenly disinterested in them. The lucky hunter might stumble across one last bird willing to heed a call, but you really can’t count on it. I approach these scenarios by investing in plenty of hiking, concentrating efforts on open meadows or agricultural fields where birds go to feed. I’m looking for sign – turkey sign and plenty of it. The most obvious includes fresh droppings, dusting areas or scratching. If I’m lucky enough to stumble onto that one meadow, field edge or ridge where turkey sign is particularly abundant, the hunt turns into a waiting game. Because I’m a bowhunter this means portable pop-up blind concealment, though the shotgunner might employ a hasty ground blind, placed within sure range of concentrated sign. I then stab a single hen decoy no more than 10 yards from my hide and settle in to wait, packing a good paperback to occupy myself, catching occasional catnaps following early wakeups. You never know when turkeys might arrive – though the modern trail camera is an effective tool in this business. I deploy a multitude of them during spring turkey seasons, just as I do during fall whitetail dates, to get a better handle on what’s happening in my hunting area and when. It’s no secret gobblers straight off the roost are more likely to respond to a call than those that have officially gone to work in areas well removed from a nighttime safe haven. We’ve all seen it; gobblers that sound off enthusiastically from the safety of a roost but clam up after hitting the ground. But hitting them right off the roost with careful calling often works wonders in fooling these savvy birds. Perhaps they’re like my friend who cannot function without a half-hour’s notice and his morning coffee, but many gobblers seem to operate on autopilot in these situations, flying down and into your lap with little regard for safety. Obviously you need to find a roost used by a gobbler or a group of gobblers. If you’re lucky enough to have a bird or birds sound off even minimally at sunset (something you can’t always count on late in the season), you’re in business. The smart hunter also uses still evenings to post on a vantage in a likely area, listening for birds flying up. The pop-pop-pop of a turkey flying up for the night is quite distinctive, the sound normally carrying a good distance. Once a bird’s roosted solidly, you’ve won half the battle. The program then involves getting into position before good light arrives and setting up in a likely landing zone. This will normally be an opening – a flat bench, open meadow or farm field – typically uphill of the roost tree(s). I like to set up a single hen decoy for the gobbler to focus on, while also giving him plenty of room, and begin calling softly with the very first morning tree calls – just enough to let a tom know I’m there and no more. The gobbler will typically leave the tree and land within range for shooting; otherwise wandering off and expecting you (the hen) to follow. This might be considered a 50/50 proposition. I’ve yet to determine why stalking a turkey is considered a poacher’s trick by so many turkey hunters. There’s no doubt, bringing a gobbler on the run through calling is certainly the ultimate, but when the chips are down, stalking not only keeps you in the game, but proves just as challenging. 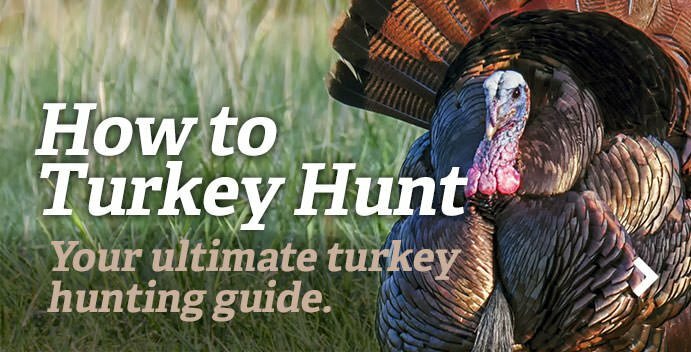 Ducking and dodging, crawling and slithering into range of a turkey requires more woods skill than finding a hormone-addled tom and yelping him into range. I guess, like jump-shooting verses decoying ducks, like worm-fishing trout instead of flicking dry flies, stalking turkeys isn’t considered gentlemanly. So be it, but sometimes when the going gets tough you have to resort to last-ditch efforts. I’ve experienced my best luck stalking spring turkeys in areas with abundant winter wheat, alfalfa, cut-corn or soybean fields or natural meadows ringed tightly with thronged tree cover or bordered by ditches or creek bottoms. Such setups make this a surprisingly productive method, the drops and vegetation found at field edges providing viable stalking cover that tips stalking odds in your favor. This is a ploy that you can use anywhere turkey habitat overlaps agricultural activities, or in forest habitat with abundant meadows. I even have bowhunting friends who have come to prefer spot-and-stalk approaches, saying it provides a more interactive and exciting alternative to the standard calling approach. Otherwise this is spot-and-stalk hunting in the classic sense, using quality binoculars to discover your quarry from a distance, then carefully studying terrain and turkey movement to plan a sensible plan of approach. Better yet, since turkeys can’t smell, the elimination of the wind factor leaves more approach options open to the hunter willing to slither and crawl to get within range. Out West, where I’ve done most of my turkey hunting over the years, I've found myself with an unpunched turkey tag and the season end looming, which meant I had to hit the trail in search of paths less traveled, mostly public-land areas made of designated wilderness where only foot or horse/mule travel is permitted. Trekking into wilderness helps me accomplish two important objectives in my quest for a spring gobbler. First, is the obvious factor of leaving crowds well behind to discover birds that might not see a hunter an entire season. Less obvious, but just as important during late-season dates, accessing wilderness often comes with a quick gain in altitude, meaning higher elevations where turkeys are just a bit behind their low-land cousins due to lower temperatures and harsher weather. Where the breeding peak might occur the first or second week of season in low areas, high-country gobblers often run a bit behind schedule, meaning they’re still in the breeding mood as seasons draw to a close. Wilderness areas anywhere rough mountain country is found are obvious attractions, but remember a single deep canyon, or nasty ridge, can create defacto wilderness simply because others are unwilling to invest the extra effort to reach its seldom-visited reaches. Granted, many of these ploys don’t offer the obvious excitement of yelping lusty toms within shooting range, with most requiring more tolerance to long hours of inaction or physical effort, but sometimes a hunter has gotta do what he’s gotta do when the chips are down. Finding yourself in a tough situation or faced with birds unwilling to play along, you can still pull success from the equation by trying these offbeat approaches. Editor's note: This article was first published on May 3, 2012. Thoughts on these tips? Please comment below.